Discovering the Orient is exciting; spending time planning your trip by considering the major travel sites in Japan is key. Whichever season you choose to visit this lovely land of the rising sun, you be sure to find many novel attractions. The islands of Japan -- Honshu, Shikoku, Kyushu, Hokkaido and thousands of smaller ones -- are located in the Far East in the Pacific Ocean. Korea is the closest neighbor, and China, Russia, and Taiwan are also nearby. Japan, the size of California, has 128 million people. 78% of the land is mountainous. Mount Fuji, Japan's highest peak, is probably the most well-known volcano. Although Japan has led the world in modern technology, the old customs and sights are still present in the 21st century. A mixture of old and new, this Asian country is like no other. At any train station, business men and women talking on cell phones, high school students dressed in uniform listening to ipods, as well as kimono-clad women headed to traditional tea ceremonies, may all be present. Consult travel tips and inexpensive airfare rates as you make your reservations for flying to Japan. A travel agent will be glad to assist you as you consider your travel itinerary. Many flights fly directly to either Osaka or Tokyo from Chicago and Minneapolis. The flying time is about 13 hours nonstop. If your stay falls under 90 days, no visa is needed for US visitors, just an updated passport. To help whet your appetite, the most popular attractions in Tokyo, Osaka, and Kyoto (all located on the island of Honshu, the largest island) include the following. Be prepared to visit this fast-paced city of twelve million people by donning comfortable clothing and a good pair of walking shoes. Tokyo, the capital, has hundreds of sights worth visiting including the famous shopping and nightlife area known as the Ginza. Ueno Park, Meiji Shrine, and Sengakugi Temple are spots you won't want to miss seeing. For art lovers, the Mitsuo Aida Museum dedicated to the calligrapher-poet who lived from 1924-1991, will be a treat. Between 70 and 80 pieces of his work as always exhibited. Nara Park is one of the most scenic sights around Osaka. This clean, green hosts a Buddhist temple with the largest statue of The Great Buddha. Tame and friendly deer freely roam the gardens and you can purchase food to feed them. 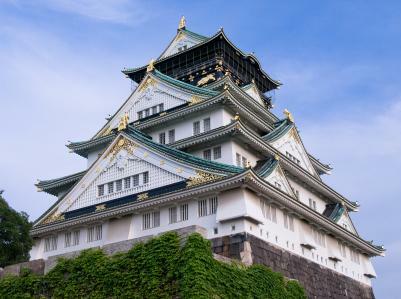 Osaka Castle, the symbol of Osaka, was built in the 16th century. The beautiful wall that surrounds the white castle is built with over 40,000 stone rocks. While many tourists think only of Tokyo when considering Japan, don't neglect one of Japan's finest quaint cities, the old capital of Kyoto. With 2,000 temples and shrines, this city also has beautiful gardens and museums. Don't miss Nijo Castle, designated as a historic site, Kinkakugi (The Golden Pavilion), and The Old Imperial Palace, where the royal family lived when Kyoto was the nation's capital city. If you happen to be in Japan in the fall or spring, and want a view of the sakura (cherry blossoms) or autumn maple leaves, pay a visit to one of the most famous temples, Kiyomizu Temple. Want to learn even more about what you can do in the quaint city of Kyoto? Sacred Destinations will assist you on what is available for the tourist. Japan has one of the world's most reliable, efficient, and clean transportation systems. Train lines run over the entire country, domestic flying is quick, and buses and taxis are plentiful in the main cities. Unfortunately, nothing is inexpensive. To get a feel for the land and view some photos of famous shrines, temples and gardens, a trip to these websites is worthwhile. The Japan National Tourist Organization's website is filled with information. Learn about the culture, travel tips, and tourist attractions at this informative site. Japan Travel Guide tells you what to see in each city, where to stay, and where to eat. If you want to plan a trek up the famous Fuji-san (Mount Fuji), this site will guide you on the official climbing season and how to prepare for your hike. Asia Rooms has links to popular attractions as well as prices of hotels and places to stay. If your visit is a short one, enjoy spending nights in the many fine hotels the cities of Japan have to offer. For a more traditional stay, book a night or two in a Ryokan, a Japanese inn where a night of sleeping on a futon, taking a hot ofuro (bath), and eating a breakfast of miso (soup), fish, and rice, is typical. If you happen to be relocating to Japan for whatever reason and need help in finding a place to rent, check out the site Japan Home Search. Keep in mind that if your work includes a move to Japan, you will need to obtain a work visa. Hopefully, you will find your time in Japan to be enjoyable and even pick up a few phrases like "Konnichiwa" (hello), "Sayonara" (good-bye), "Yokoso" (welcome), "Arigato" (thank you), and "Konbanwa" (good evening). Most Japanese are extremely glad to have you visit their country and will be delighted to assist you should you need help with directions. Their English speaking ability may be limited, but they will certainly try to understand you!